The larynx is located about half way down our neck. It can be thought of as a short tube. At the top it is connected to the throat, and at the bottom it is attached to the windpipe, so it’s a part of our respiratory system. How does the larynx stop food from “going down the wrong way”? The larynx has a kind of lid to prevent food from entering the windpipe and lower airways: This lid is called the epiglottis. 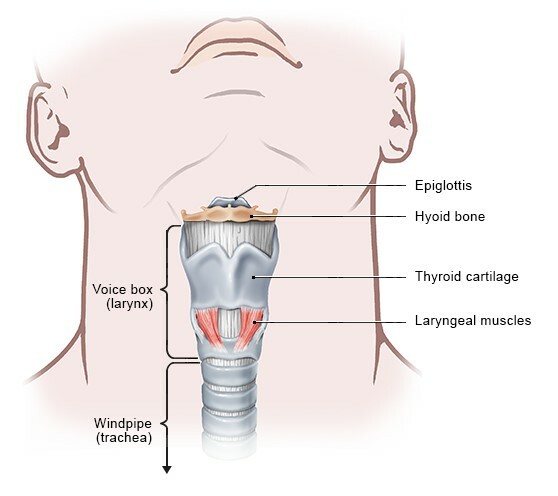 It is attached to the top part of the larynx, where it can close the entrance to the larynx. When we swallow, it moves down to keep any food or liquids out of the windpipe. 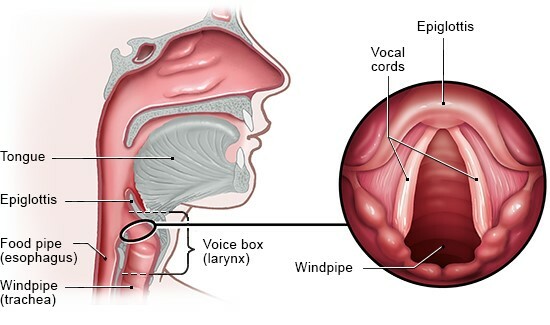 How does the larynx produce your voice? The lining of the larynx has folds across it about halfway down. These are known as the ventricular folds. Looking into the larynx from above, they look a little like curtains that have been drawn open slightly. The vocal cords run along their edges. The gap between the two vocal cords is called the glottis. By using ligaments and muscles, the vocal cords can be opened and closed, tensed and held together closely – which looks like the curtains being closed. When we breathe out, air flows through the gap between the vocal cords. Depending on their exact position, this causes them to vibrate in different ways, resulting in different tones. Together with the movements of the tongue and mouth, very different sounds can be produced at different volumes, allowing us to speak and sing. In childhood, the vocal cords of boys and girls are equally long. The larynx grows during puberty. This makes the vocal cords longer, lowering the voice – there is a noticeable “breaking” of the voice, especially in boys. Men have a considerably larger larynx than women do, which is why men typically have a deeper voice.